CCIE WBs, CoD, VoD etc. Week One of the bootcamp includes 40+ hours of hands-on lecture on core CCIE Routing & Switching topics, and is spent exposing the fundamental principles behind the technologies covered in the CCIE Routing & Switching Lab Exam. This week is designed to provide you with foundational technical understanding, not to supply candidates with tips and tricks to pass your Lab Exam. Week Two of bootcamp includes another 40+ hours of hands-on lecture of advanced topics and scenarios. This second week of the advanced technologies bootcamp will take the student’s understanding to the next level required to obtain the CCIE certification. Candidates will delve deep into advanced implementations of the topics covered in week one, as well as into advanced interactions that occur when technologies are implemented in tandem. Understanding the topics covered in week two will ensure that students are ready to take the next step in their CCIE preparation, applying the technologies in full-scale 8-hour lab scenarios. 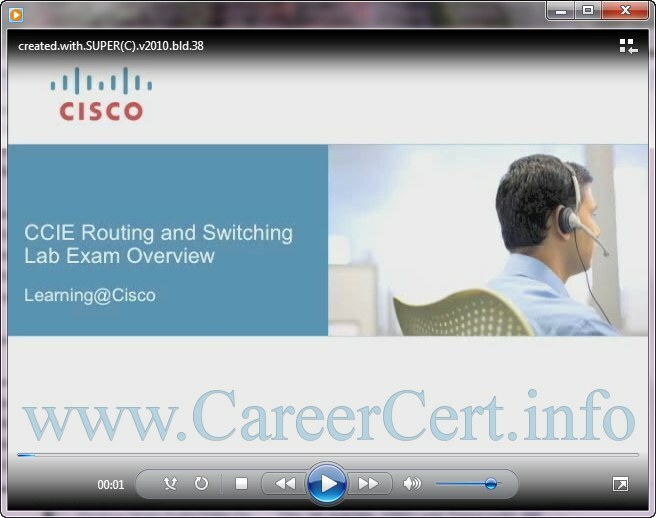 CCIE Routing & Switching candidates who have already obtained their CCNP or have equivalent level of knowledge. This Bootcamp is also beneficial to those CCIE candidates who have attempted the actual CCIE lab exam without passing and need to build on their understanding of the fundamental topics. These topics include IGP Redistribution, BGP, IPv6, and QoS. After completing the CCIE Routing & Switching Open Lecture Series, you will be prepared to do the labs in the CCIE Routing & Switching Workbook Volume 1 and the CCIE Routing & Switching Workbook Volume 2. CCIE Routing & Switching Advanced Troubleshooting Bootcamp is a combination of lectures focused on structured troubleshooting approach, and advanced hands-on troubleshooting lab scenarios. The class is designed for students seeking to solidify their troubleshooting skills, master structured troubleshooting approach and spot their weak areas. This demo will familiarize candidates with the online interface that has replaced paper exams, which presents the virtual topology, test questions, documentation and tools. Strongly recommended for all candidates. Volume IV – Advanced Troubleshooting contains 10 scenarios designed exclusively to prepare you for the new Troubleshooting part of the CCIE R&S exam. Every lab contains 10 trouble tickets that you have to resolve in order to return the sample network to the baseline configuration. Every solution breaks down the troubleshooting process in detailed steps, allowing you to master the structured troubleshooting approach. 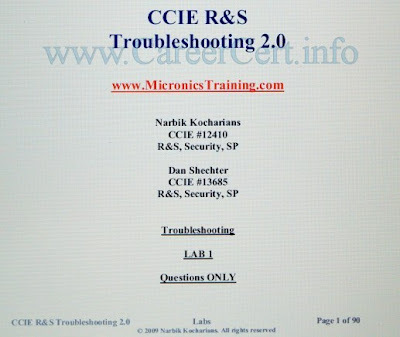 Recent changes to the CCIE R&S exam include the addition of troubleshooting section. During this part of the updated exam, you will be given a separate topology and a set of “incident” scenarios requiring you to apply troubleshooting skills and fix the broken network. Passing the troubleshooting section required to successfully pass the entire Lab Exam. It requires not just the in-depth understanding of the networking technologies but also the ability to effectively manage your time and apply structured methodology for finding and resolving the networking issues. CCIE R&S Lab Workbook Volume I consists of nearly 600 (six hundred!) hands-on individually focused advanced technology labs that present topics in an easy to follow, goal-oriented step-by-step approach. Every scenario features detailed breakdowns and thorough verifications to assist you in getting 100% understanding of the particular technology. By isolating each topic on its own you are able to see, firsthand, the various ways to configure each technology. By understanding these fundamental technologies, you will then be able to predict advanced and sometimes subtle interactions when configuring multiple technologies together. Volume II – Full Scale Practice Labs provides 20 detailed, full-scale labs similar to the actual CCIE lab exam, which follow a structured design covering all necessary topic domains on the configuration portion of the CCIE lab exam. Throughout each lab, you will configure the necessary technologies to build a complete Routing & Switching CCIE Lab topology. 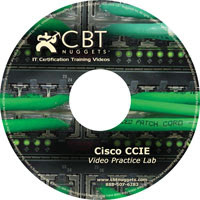 The full scale labs contained are designed to simulate the actual CCIE Routing & Switching Lab Exam and at the same time illustrate the principles behind the technologies which it covers. Each full-scale lab is accompanied with a solutions guide. Based on CCIE RS V.3 including the workbook. Khawar Bhutt, Quad CCIE, explains the solutions of questions in the workbook in detail. CCIE Routing & Switching Advanced Technologies Class is the first step in understanding CCIE level technologies and is a companion to the Advanced Technologies Lab Workbook. Each technology you need to know for the CCIE Routing & Switching lab will be described in detail using an instructor led hands on demonstration. The class consists of nearly 80 hours of in depth explanations and examples. Cisco has decided to eliminate the Core Knowledge questions from the current CCIE R&S v4.0 and CCIE Voice v3.0 Lab Exams. Beginning on May 10, 2010, CCIE R&S and CCIE Voice Lab Exams, in all global locations, will no longer include the four open-ended Core Knowledge questions. The total lab time will remain eight hours. For the CCIE R&S Lab Exam, this means candidates will begin with the two-hour Troubleshooting section, followed by a six-hour Configuration section. For CCIE Voice, candidates will have the full eight hours to complete the integrated exam. At this time, only the R&S and Voice certifications have been designed and validated to allow removal of Core Knowledge. Exercise Workbook: To reflect the recent changes to the Routing and Switching CCIE lab, Cisco 360 now offers hands-on practice labs in two formats. In the v3.0 format, each lab contains a single multi-topic configuration scenario. Each of these scenarios will take at least eight hours to complete. In the v4.0 format, each lab is divided into two parts: a six hour configuration section and a separate two hour troubleshooting section. all links removed can update them . CBT nuggets link is not working, please update it. Attempting to extract files under NMC CCIE RS TS Block-2 “Block 2 – Troubleshooting Routing Protocols” but i keep getting error “Missing archive parts. This archive consists of several parts, each in separate file. Cannot find some parts of the archive. Try finding missing files and extract again.” Can somebody help? Any one can help and provide me with K6 and K7 .pdf for CCIE R&S lab would be much appreciated. hi, please reupload CCIE R&S ‘CBT Nuggets’ Written + Video Practice Labs by Jeremy in 4shared or else, the hotfile link is empty. I want ccie R&S videos by jeremy.can u help.ur link is not working.pls give me some other link.